A computer modeling project led by University of Illinois’ Marcelo Garcia has largely confirmed the accuracy of methods used to monitor the flow of the Chicago Sanitary and Ship Canal. The finding may appear uneventful, but the history of the canal makes an accurate accounting of the amount of water moving through it uniquely important. 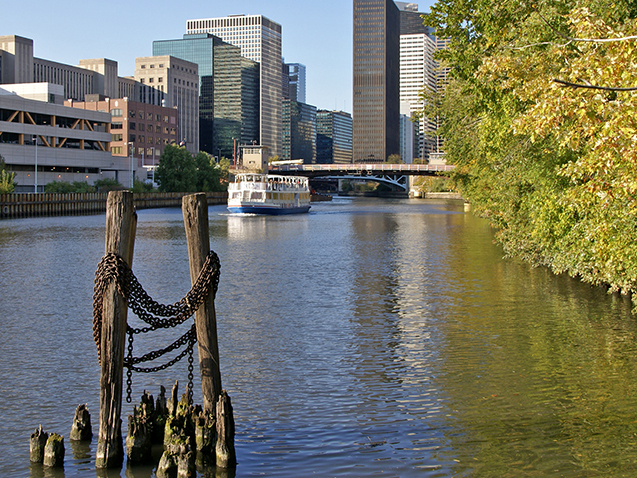 The canal was opened in 1900 to reverse the flow of the Chicago River—a change that shielded Lake Michigan, the city’s primary source of drinking water, from contamination and helped dilute sewage and runoff pollution. Roughly 30 years later, the U.S. Supreme Court imposed a limit on how much water could be diverted through the canal to ensure lake levels stayed high enough to meet the needs of other communities. The cap is maintained today by a series of locks and dams, and the canal’s flow is closely monitored by federal and regional agencies. Garcia and his team conducted their study in partnership with one such group: the U.S. Geological Survey (USGS) Illinois Water Science Center. Measuring the volume of water moving through a system directly is difficult, so USGS uses an empirical method known as a rating curve to quantify the canal’s flow based on regular velocity readings taken near Lemont, Illinois. A miscalibrated curve could mean more water is being pulled from the lake than federal mandates allow. So Garcia and Dutta developed a 3D numerical model of the canal from where it meets the Cal-Sag Channel to the Lockport Powerhouse downstream. This allowed them to simulate rainstorms of varying intensities and monitor their impact on the canal’s flow. “The results dispelled any doubt that the USGS rating curve doesn’t work during storms,” Dutta said. The model did, however, reveal a scenario that could render USGS measurements inaccurate at times. When the Chicago Sanitary and Ship Canal meets the Cal-Sag Channel, the mechanics of the canal are temporarily disrupted—like traffic during a highway merge. The disruption typically has little impact on measurements taken at Lemont. But if the water in the Cal-Sag is colder than in the canal, the mixing caused by the cooler, denser water plunging to the bottom could lead USGS to conclude that more water is moving through the canal than actually is.